How Far is DSMAX SILVEROAK? DS-MAX Silveroak apartment offer everything that one needs to lead an effortless lifestyle. An awe-inspiring apartment perfectly priced to lead a magnificent life. It is for those who seek nothing but the best in an absolute eye-catching apartments. Our luxurious residence offers 2 BHK and 3 BHK apartment for a better living, which is specially built to suit your requirements with ambiance, serenity and luxury living. The marvelously designed apartment are wonderfully positioned at “Kammasandra” Bangalore South. This luxurious residence is close proximity to Electronic city, where major IT firms such as Infosys, Wipro Technologies, CGI, Siemens and Hewlett Packard are located, easy access to many commercial centers in vicinity. Since, DS-MAX Silver Oak apartment are centered in Silicon Valley Lifestyle it successfully drives your acceptation and requirement. 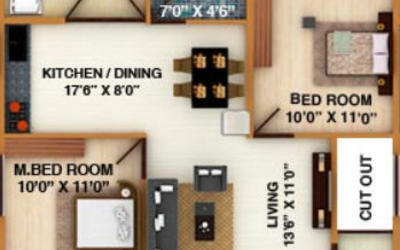 It is integrated with finest design floor plan, comprising plenty of modern style and efficient living space. At DS-MAX Silveroak every residents will acquire ever-lasting pleasure with its enhanced amenities.